Author's Note: Since writing the article below I have found what, in my opinion is one of the best inventions in the world! The flea comb!!! The teeth on the flea comb are so close together, they easily remove fleas, flea eggs and their eliminated "flea dirt." 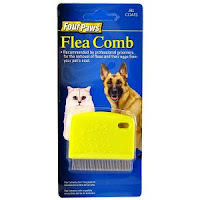 By flea combing my active dog and indoor cat daily I have nearly eliminated my once frustrating flea problem. The fleas have been extra fierce in San Diego County this year. Instead of feeling overwhelmed by this issue, I now experience life without fleas! 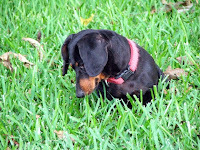 I find an occassional one or two fleas when flea combing after my dog's daily rolls in the grass, but that is it! My pets and I are much, much happier!!! Daily flea combing (I started with twice a day and now do it once a day), along with vaccuuming every 2 to 3 days are my number one tips for a flea free household. Save money and your pet's health! Avoid using the topical spot-on and ingested pill form flea treatments. I am so thrilled about this simple, but genius invention, that I Googled in an attempt to find the inventor of this useful item. I couldn't find out the originator, but whoever you are. XXOOXXOOXXOOXX from all of us!!! Also - although it has worked wonders for many, I have had to stop using the Buck Mountain Parasite Dust mentioned in my article. It irritated my respiratory system and every time I used it I would get a cough that would last for a couple days. The cough was my body's reaction to the dust as it tried to rid itself of the irritation. Thanks to the flea comb I very rarely use any sprays or other treatments at all anymore! Want tips on how to most easily use the flea comb? Want to teach your pet to LOVE its flea combing sessions? Email me at info@wildtame.com. Life is about learning. I love the educational process and continual journey. I also enjoy sharing what I learn with you! We all know what fleas are, those annoying dark colored creatures that hop on our pets when they sit or roll in the grass, visit the beach or park or stop to say hello to a fellow furry friend. Although they seem to jump as if they are flying, fleas are wingless insects capable of piercing skin and sucking blood. This in itself, sounds unappealing, but add to it the potential of having these unwelcomed visitors as permanent residents in your home, laying eggs, multiplying relentlessly and causing stress and potential discomfort to you and your pets. Although this is not a desirable situation, it is one many of us have experienced. In addition to this, some animals are allergic to flea saliva. This allergy can lead to more severe skin irritation that gets worse as the animals lick, scratch and bite the affected areas in an attempt to get relief. Fleas are also capable of transferring diseases between animals. It is obvious we need to keep fleas away from our pets and homes, but how do we do it? Most people have heard of the over the counter “spot on” treatments, such as Advantage and Frontline. Although some may have success with these, fleas can and do build up a resilience to them. If you have tried these or similar pesticides and they have not worked, now you know why! In addition to the possibility of these products not solving your problem, they are highly potent chemical pesticides! There are many other products, including pesticides administered in pill form that I have not mentioned. Some are available over the counter, while some can only be purchased in a veterinarian’s office. I admittedly have used some types of the aforementioned toxic items to prevent flea infestations. However, once I learned about their potency, I became interested in finding less harmful alternatives. It is disturbing to read the labels on the “spot on” and related flea treatments. They advise us humans to “avoid contact with our skin and wash immediately” if it occurs. With such a warning, should we be so quick to apply them to our pets? It does not make logical sense, let alone seem like a kind thing to do to our beloved companion animals. So, what can we do to keep our pets safe and flea free in San Diego County, which seems to be paradise for this pest population? Luckily, we have a number of independently owned health conscious pet stores throughout San Diego County that offer natural alternatives to the toxic options. I have tried a variety of natural products and found that, once applied they worked great temporarily. From this, I learned that flea prevention is not a one time thing. Unlike the claims of 30-day results made by the manufactures of the toxic pesticide products, the natural items need to be reapplied and used more frequently. However, it is worth it to me to avoid filling my pets with toxins. I also have learned that using multiple products is sometimes necessary. The severity of your flea issues can vary depending on what part of the county you live in. However, if faced with this problem, patience and diligence win the race over the aggressive fleas. To give you a head start when addressing your external environment, helping your pets have a strong inner defense is essential in successful flea control. Nutritious foods and any needed supplements, along with adequate exercise will help build and maintain a healthy immune system. Fleas prefer a weak host, as it allows them flourish with more ease. The healthier your pets are, the less likely they are to be affected by fleas. Bathing can also help eliminate fleas on your pets, but be careful not to over bathe them, which can lead to dry skin and other issues. A monthly bath with a gentle, natural shampoo, along with thorough water only rinses as needed, will help in the fight against fleas. If needed, an additional sudsy bath can be added of course, to keep your pets clean and flee free. It is also important to remember that the fleas on your pet are only a part of the war to conquer. In addition to those that you can physically see, you can rest assured that there are growing flea families happily nesting in your rug, bedding, upholstered furniture and anywhere else that provides a safe place for them. I recommend very frequent vacuuming of carpet areas, as well as upholstered furniture. Immediately disposing of the used vacuum bag with help avoid reinfestation. Frequent washing of pet bedding and anything else your pets may lay on is also crucial. These cleaning processes will aid in the killing of any eggs left by the prolific fleas that have plagued your home. It will be difficult to achieve the flea free results you are aiming for without tackling the larger physical living environment, as well as your pet itself. Tomb Stone by Great Life is a spray that seems to kill fleas on contact, or at least slow them down enough so they can be picked off. I was told it is safe to spray it on bedding, furniture, and any surface, as well as on your pet. With lavender being one of the main ingredients, I found that it smelled pleasant, which is a plus when spraying it in and on your home environment. Citronella based Purely Botanical Flee, Flea! by Dancing Paws is another spray that some have had great success with. Both sprays are available at Paw Country in La Mesa http://www.welcometopawcountry.com/. I recommend spraying the product into your hand firsts and then applying it on your pets. Some animals do not like the sensation of being sprayed directly and prefer a gentler application. Buck Mountain Herbal Gold Parasite Dust for Animals, which is available at Point Loma Pet Pantry http://www.pointlomapetpantry.com/, has brought relief to many pets. I recommend applying it on your pet while either outside or in an open area. Since it is powder, particles can be inhaled during the process and you may find this unpleasant, as I did. This powder can be applied directly onto your pet, bedding, furniture, as well as the carpet and then vacuumed up. However, it is a yellowish powder and not everyone may choose to have this added to their belongings. Grocery store purchased, Borax, which contains Boric Acid and Diatomaceous Earth, available at Paw Country and Point Loma Pet Pantry, are two other flea killing powders that can be sprinkled on carpets and vacuumed up. Another option is FTI Pet Products’ Flea Treats. Both my dog and cat love these tasty tablets as treats! They contain Brewer’s Yeast and B vitamins and are available at Point Loma Pet Pantry, Healthy Pet Pantry in El Cajon http://www.healthypetpantry.net/ and Wholesome Choice Pet Market in Rancho Bernardo http://www.wholesomechoicepetmarket.com/. Some people swear by them. I have never used them alone, but instead as an additional precaution, along with a spray, the parasite powder, and of course diligence. If you have questions about flea treatments, behavioral issues or nutrition concerns, I welcome your emails at info@wildtame.com. You may wish to visit my website at http://www.wildtame.com/ to learn more about alternative and holistic approaches to pet care.